NRGpilot™ is a cloud computing service that uses smart grid technology to manage DER (distributed energy resource) systems. A gateway is installed at the site which communicates with the DER equipment such as inverters, sensors, meters, cameras, and charge controllers. Collected data is sent by internet to Cachelan servers for live status, lifetime storage and processing. 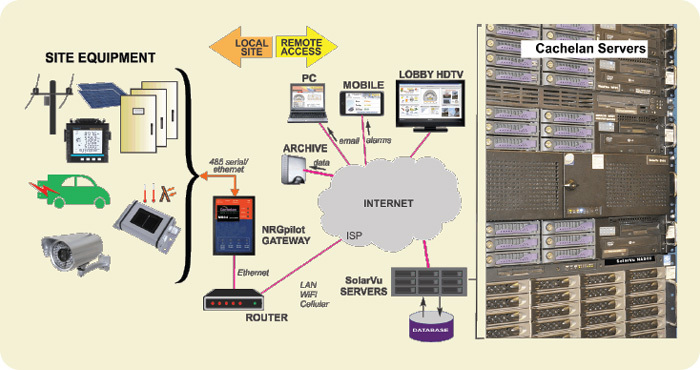 Users access their NRGpilot™ portal from a browser on a PC or mobile device that connects to the Cachelan servers for high speed connections. No software needs to be installed and regularly updated. There is no computer hardware that needs to be purchased or maintained. When faults are detected an alarm is sent by email. Analysis tools like 30 day logs and live equipment status help O&M staff quickly determine what remedial action is required to minimize downtime. Data for any time period can be downloaded for performance analysis and archiving. Custom on site or NRGpilot™ in the cloud? In the past a system would be installed on a local computer to monitor and control equipment. This requires expensive custom software design, periodic computer repairs with software upgrades and a maintenance contract. An NRGpilot™ portal eliminates these headaches. NRGpilot™ servers are hosted, maintained and continuously upgraded with new features by Cachelan. Site setup only requires configuration of templates to quickly create a new NRGpilot™ portal to match installed equipment. By hosting many sites on shared equipment owners get cost effective energy portals that can be customized to their needs. Cachelan servers are located in a tier 1 data center for high speed downloads with generator backup for reliable 24/7 operation. This ensures NRGpilot™ portals are always available as long as there is a local internet connection to provide the live data. Data is stored for the lifetime of each system and backed up in redundant RAID NAS. Customers that wish to also keep a copy of their data remotely can use the download feature to access their data files through the password protected SETUP link.